With a Five Year Old Grandson is very rewarding. Can you find a small purple pot with a plant in it? Granma asked Theo. After a few moments of searching the pot was found. The bigger glazed green pot was ready to receive a small trowel full of potting mix. Theo tipped up the small pot and grasped the herb, a small Chives plant, which he placed into its new home. He scooped more potting mix and tamped it into place with every trowelful. The chives were securely standing in the new green glazed ceramic pot. Could you pull out the brown hairs? Granma asked. He began pulling off the many dead strands for a few seconds. Takes a long time he said! Weird one he remarked, at a green Chive with a brown tip. You can break off that dead end she said. What now? Theo asked. Time to water plants, can you hold the big hose? Granma asked. Of course he could and deemed it an honour. Does the Chives herb look better? Granma queried. Yes it is all green now the boy answered. He seemed pleased. Children love smelling herbs. A crushed mint leaf is a wonderful way to introduce them to herbal aromatics. Children love Chocolate Mint simply because of its name. Parents and dentists like that idea as well! Be aware that Nettles are abundant after rain and that children may grab a plant and be stung. Simply squash a Nettle leaf and rub it on the sting, which will go away immediately. Just before Mothers’ Day the boy’s mother remarked that she needed to make some items for the Mothers’ Day Gifts Stall at school. “Bunches of fresh herbs would be fine”, she said. “I can cut the Bay leaves the six year old offered. So Parsley, Sage, Bay and Rosemary were gathered, tied and surrounded by green wrapping. All ten bunches sold quickly. Two little grandsons playing in the paddle pool on a hot October morning run on the grass, jump back into the water and scoop water in bowls, let it drop back into the pool. One child gathers Lawn Daisies in a red plastic cup, adds water to them and pours daisies and water alternately on to the grass and back into the ’pond’. Such fun! A sunny winter’s day in July and the Salvia involucrata ‘Bethelli’ was blooming with large pink flowers, which the birds love for nectar. They sway on the branches and dip their beaks into the bright petals. Three year old Theo picked up a small flowering branch and waved it round as he ran round on the grass enjoying the freedom of open space. Walking in the park with Patrick Granma pointed out the Dandelion seed head. She picked the stem and handed it to Patrick. He was amazed as she blew the first tiny parachute seeds away. He tried to blow but sucked in his breath and snorted! He ‘blew’ again and a few tiny seeds wafted away. After four years of gardens and plants with Thomas now five years old, the rewards are now evident. A card with a Garden Green House backed by a Potting Shed was proudly given by the family But five year old Thomas had drawn his own card with Granma holding his gift to her and a plant pot with a little leaf. He had chosen a green pen with a bee on top, standing in a little orange pot. Chosen by him from the sales table at school! He was only nine months old but he loved touching flowers. Not grabbing as many babies do. He approached the petals with a tentative wonder, surprisingly gentle. He watched the fuchsia flowers swaying in the breeze, then cautiously touched the pinkish purple petals and pale pink backing sepals. His pale blue stripes and his mother’s jumper created a pastel background for the gorgeous flowers and the delicate appreciation shown by a little lad. When is the right time to introduce your grandchild to the Garden? My answer is sooner. My daughter Sophie was outdoors in her pram from three weeks of age. Yes a green netting was draped from the pram’s hood to her blanket. It was early November and she loved watching the plum tree’s branches waving in the breeze. The calming atmosphere of the garden was soothing for her mother too. A first baby is a huge leap in stress for the mother. At eight months onwards, wearing a Nursing Mothers’ Puddle Suit and crawling expertly over the dewy grass, both my children adored splashing in puddles , touching leaves and digging in the earth. They looked like little butter balls in the flexible bright yellow rain proof suits. In fact I have a photograph of Sophie admiring a daffodil at the base of the apricot tree, both clothed in delightful gold. Later at two to three years a royal blue Puddle Suit meant freedom to play in the rain soaked back yard. A little human iris bobbing about with a bucket and spade. Thirty plus years later little Thomas has become a compulsive gardener. At one year he was patting the leaves of silver beet and lettuce. He would crawl to find his new watering can so we could water the tomatoes and strawberries as well as the leafy vegetables. Then after a grand mother ly demonstration of pulling weeds, he always wants to pull at the seeding grass clumps and to toddle to the compost bin, where his ‘Gran’ used to lift the lid and the little chap would drop in his handsful with satisfaction. Then would say “More” and move to a new clump. Now he can just reach the top of the bin, if he really stretches, drops his grassy stems and totters off for more! His latest task has been picking off the fence the dried ivy leaves, and adding them, painstakingly, to the compost bin, on tippy toes. At fourteen months Thomas held Grandad’s hand and threw the potato pieces, each with sprouting eyes into the holes dug by Granma. For each Thomas covered the potato piece with soil and then “patpatted” the spot. Finally after eight times, he found his plastic watering can and sprinkled all with water. It is so cute watching the little gardener crawling away speedily for each implement. Yesterday when Sophie was hanging the washing, Thomas ventured into the garden by himself. He smelled so delightfully of rosemary. Every day on the pram journey to the park Thomas asks for a piece of lavender from the hedge, five doors away from home. It’s never too early for herbs! Thomas has picked a tomato for Mummy and a cucumber for Daddy. He peeps under the netting to see if the strawberry is red yet, then he re-drapes the net. He loves sweeping the brick paving and picking up the mulch and throwing it back on the vegetable garden. Of course he loves smelling the mint and basil. Who is more tired after these enthusiastic exploits? Grand ma of course! Thomas was eating dinner. His mother suggested that he eat his broad bean. But Thomas refused. ‘Why not’? His mother asked.’ Because it has a tusk’ Thomas, aged two years and eight months, replied. Last week James aged two and five months came to play in the garden. They dug with trowels, unfortunately in the bed with recently planted carrot seedlings. But when asked moved to two large tubs and dug happily for a while. James spied the bright Chilli pepper and lifted one red pepper to his mouth. Thomas said “Very hot, don’t”. Thomas’ mother saw and yelled “No James drop it!” James began to cry, but the red chilli pepper had not touched his lip. Hands were well washed and no harm done. Today Granma photographed the Chili Pepper bush at the back of the garden bed and the Blueberry bush just in front of it. Thomas’ Blueberry plant is covered in tiny rounded pink flowers. “Look Thomas, Blueberry flowers” Granma said. Thomas looked and said “Yes”. Thomas gave Granma a trowel. “Yours” he said. Grandad asked Thomas “Where is the Rosemary?” No answer. “Thomas what colour are the Rosemary flowers?” Thomas kept on ‘mowing’ the paving with his yellow truck. Granma asked “Thomas could I pick some Rosemary please?” “No, it’s mine” said Thomas decisively. Granma pleaded “just a little piece please Thomas”. “All wight, a tiny bit, said Thomas, picking a tip with six leaves. Granma stuck the bit behind her brooch. “Thanks Thomas, she said. He was engrossed with pushing his truck. Granma began to take movie sound films on her phone. “What you doing Bama?” his first name for his grandmother. “I’m taking photos” she answered. “I see?” he asked. Thomas was surprised and loved the little movie. “Press the arrow to see it again” said Granma. Thomas did. Granma found Thomas’ yard broom and began sweeping up the pile of prunings, clipped off by his father last weekend. “My broom” Thomas said in typical two year old fashion. He put the broom in the laundry next to the big house broom in the corner. He returned to the yellow truck and ran it up the brick paving to the back fence and returned. Granma retrieved the broom and piled up the clippings of geranium, westringa, Rosemary, Roses, Bay and some dried weeds. The pile was big. “What are you doing with that?” asked Grandad. “How about putting it up behind the compost bin?” she suggested. Grandad scooped up the bundle and carried it to the end of the yard. Thomas drove some bits that Granma threw into his truck. Granma was weeding; “I help?” queried Thomas. He was welcomed. Thomas began pulling weeds from the edge of the vegie patch, expertly leaving the parsley seedlings. Granma said “be careful of the carrots”. Thomas said “I know the carrots”. He grabbed another handful of weeds and gave them to his grandmother. She dropped them into the yellow truck and began to tug weeds too. Thomas grabbed the truck and motor voiced to the compost bin. He picked up a handful of weeds, lifted the lid and threw them in, expertly avoiding the tiny flies, in the bin. He has joined the seasoned gardeners. Last Friday my grandson had to take some natural material, for show and tell, to ‘ Lemon Tree’, his crèche. He chose six herbs from the garden. He was able to tell the names of five to the other children and the staff. 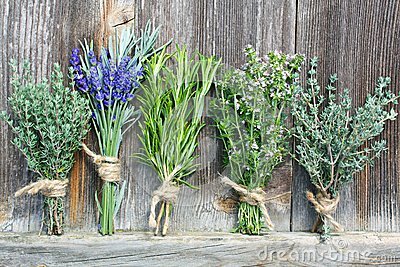 Lavender, Rosemary, Sage, Bay and Rose were all explained. If you wish to view Thomas in the garden look at our web site: www.herbsocietyvic.org.au and go to the article. “Look Grandad, creatures camouflaged!” Thomas was checking under the Bay tree and Rosemary prunings which had been left in a narrow strip near the side fence to encourage insects. A perfectly sunny Spring Sunday, so the garden called. Mummy was emptying the compost bin, the very one which Thomas had added to often. Grandad, Granma and Thomas held seedling trays for a spadeful of compost, carried them to the sunny side and tipped each onto the vegetable plot. Once emptied the compost bin was replaced, the Bay and Rosemary twigs criss-crossed for air in the bottom. Grandad dug up three large Silver Beets and Granma replanted them on the shadier side, alongside a big pot of Spinach, which needed to be in the ground. Granma was digging energetically. “You killed a worm Granma! Go away. Go home. Not nice to worms” came Grand boy’s protest. She plodded on, filling four holes with seaweed water and pushing in the pruned Spinach and Silver Beet. After five minutes his Mum said “Then you don’t want Granma to come to your birthday.” Oh yes” was the reply, after a surprised gasp. Mum planted Lobelia, Capsicum and Tomatoes in the composted bed, Grandad and Thomas put potting mix in two tubs: one large deep pot for Dad to plant Corn and a long shallow self-watering pot for Basil, to be placed beside the tomatoes. Grandad held open a plastic bag for Thomas to push in all the Silver Birch twigs Thomas had collected for Grandad’s pot-bellied stove fire. Thomas and Granma picked off rusty Geranium leaves for the rubbish bin, while Grandad swept the brick paving, Dad came home from his walk with Baby Patrick, now asleep in the pram. Granma brought in the washing and Mummy put on the kettle. “We did a good job!” said Thomas, not yet four years. And we had. Children love gardening, playing with earth and water, as well as popping bulbs into holes they have dug and sprinkling seeds onto newly smoothed sand. Father, Mother, Grandad and Grandma can create hours of fun for tiny tots. Plant Borage, Borago officinalis seeds. In six weeks the plant blooms with its pretty peerless blue star flowers, which are edible. The flowers can be added to salad and to fruit salad. Borage flowers can be painted with egg white and dusted with icing sugar, allowed to set and used as a decoration on a cup cake. Next we were to plant bulbs of tulips and hyacinths. The tub for that purpose was growing weeds and parsley seedlings. Thomas pulled the weeds and put them in the compost bin. Granma suggested that the parsley could be planted in the garden on the edge near the onions. Thomas dug four small holes. Then he scooped each seedling and with help carried each on his ‘spade’ to its little hole and patted each parsley plant in. Next we added some manure to the tub and Thomas planted five tulip bulbs and three hyacinth bulbs equally spaced with the green shoots on top. He loved patting more potting mix on top of the bulbs. Thomas began mowing the grass with his Tonka truck while Granma dug up the apple tree that Dad had planted the day before, looking for the ring. It was lunch time. Thomas loaded the trowels, “spades”, into the truck and drove them to the laundry to be put away. He saw his watering can in the sand shell and asked for some water.” Water bulbs Granma”? “And parsley too?” she added. Washing hands from watering can water is so much more exciting than a washer! It’s amazing for a two and a half year old. But then he knows to stop, in his street, at the lavender hedge to check for cars when he rides his tricycle with his parents. Thomas recognises orchids, lilies, geraniums, daisies, basil, parsley, fuchsia, strawberries, tomatoes, potatoes, silver beet, zucchinis, onions, “buberries” bush and of course lavender, roses and rosemary. However even more rewarding are his requests to go into the garden, even when there is no lost ring. An eighth generation gardener has been born! No! trained!! Thomas was eating dinner. His mother suggested that he eat his broad bean. But Thomas refused. ‘Why not’? His mother asked.’ Because it has a tusk’ Thomas, aged two years and eight months, replied. Last week James aged two and five months came to play in the garden. They dug with trowels, unfortunately in the bed with the recently planted carrot seedlings. But when asked moved to two large tubs and dug happily for a while. James spied the bright Chilli pepper and lifted one red pepper to his mouth. Thomas said “Very hot, don’t”. Thomas’ mother saw and yelled “No James drop it!” James began to cry, but the red chilli pepper had not touched his lip. Hands were well washed and no harm done. Today Granma photographed the Chilli Pepper bush at the back of the garden bed and the Blueberry bush just in front of it. Thomas’ Blueberry plant is covered in tiny rounded pink flowers. “Look Thomas, Blueberry flowers” Granma said. Thomas looked and said “Yes”. Thomas gave Granma a trowel. “Yours” he said. Granma found Thomas’ yard broom and began sweeping up the pile of prunings, clipped off by his father last weekend. “My broom” Thomas said in typical two year old fashion. He put the broom in the laundry next to the big house broom in the corner. He returned to the yellow truck and ran it up the brick paving to the back fence and returned. Granma retrieved the broom and piled up the clippings of geranium, westringa, Rosemary, Roses, Bay and some dried weeds. The pile was big. “What are you doing with that?” asked Grandad. “How about putting it up behind the compost bin?” she suggested. Grandad scooped up the bundle and carried it to the end of the yard. Thomas drove some bits that Granma threw into his truck. Granma was weeding; “I help?” queried Thomas. He was welcomed. Thomas began pulling weeds from the edge of the vegie patch, expertly leaving the parsley seedlings. Granma said “be careful of the carrots”. Thomas said “I know the carrots”. He grabbed another handful of weeds and gave them to his grandmother. She dropped them into the yellow truck and began to tug weeds too. Thomas grabbed the truck and motor voiced to the compost bin. He picked up a handful of weeds, lifted the lid and threw them in, expertly avoiding the tiny flies, in the bin. He has joined the seasoned gardeners. The family had moved into their new home one week before. The twenty-three month old little boy loved out doors. He put his hand into the birdbath water and laughed with joy. He splashed the surface of the water and watched his grandmother’s reaction. He picked up a brown bud from the garden and popped it into the bird bath, watching it float. the grass. He saw his little metal gardening tools, a fork, a rake and picked up the spade. He began to dig up clumps of soil and sprinkle them onto the grass. He laughed as he watched the soil drop. He wandered over to the white petals on the grass, spied a big white pebble and picked it up. He scrambled into the garden bed and found another pebble among the petals. He persisted till twelve pebbles were on the plank of wood. He picked them up one by one and dropped each with a sound to match its size: a little “oo” for tiny pebbles and a growly “OOOUH” for each large one. The little orange watering can caught his attention next. He picked it up and held it under the tap. Once filled, he carried the watering can to the red pots and watered each one. The Thyme, Mint, Violas and the succulent all were well watered. Next morning he asked his father to fill the watering can again, showing him how to pour the water carefully. He turned two years old, two weeks later. Once children have been introduced to gardening at an early age it becomes a natural part of daily life. My Grandson Thomas told his mother that he had a message for Granma. My daughter rang me for the little three year old to talk. “Granma, tomatoes finished in the garden, no more. Sorry” was the message to me. Yesterday he wanted to plant seeds of carrots and beans. His mother said ”let’s wait to plant those near your birthday in spring.” so already he is learning about the seasonal garden activities. It is the last time to plant bulbs. Last week Thomas planted daffodil bulbs with his mother. They had already begun to sprout, because they had been summering in a dry shady spot in the garden, loosely covered with mulch. This year they will be among other plants: ‘Blue Spires’ salvia, pink Shirley poppies, flat leaf parsley, Flanders poppies and dark blue lobelia. A rainbow of colour.